New research brief argues that an affirmative vision of voting rights must recognize factors currently treated as “background conditions” of voter suppression instead as causes on par with suppressive laws themselves. BERKELEY: An aggressive push over the past several years to adopt voter suppression laws in states across the country must be countered with a multi-faceted approach that includes comprehensive voter education, building outreach infrastructure, addressing voter ambivalence, and other steps that focus on direct engagement with groups targeted by such legislation, a new Haas Institute research brief argues. 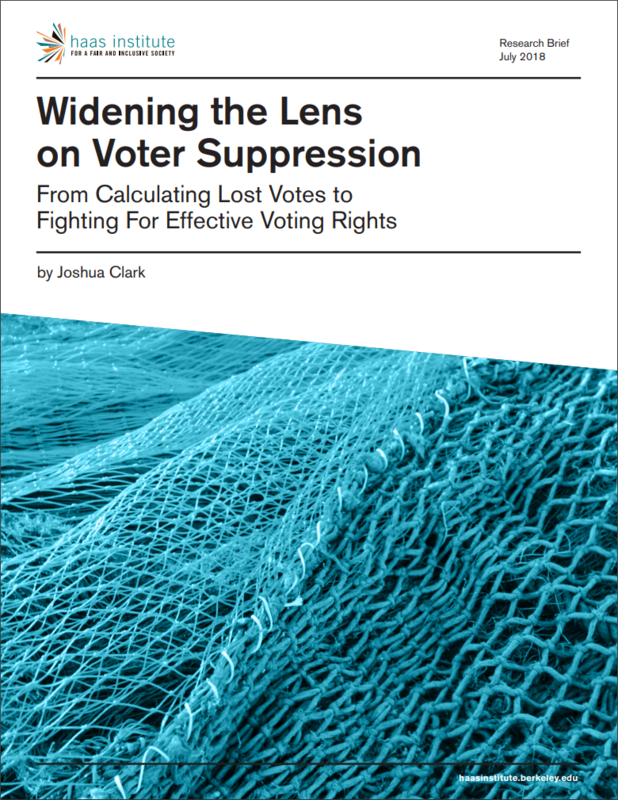 “An affirmative vision of voting rights must recognize factors currently treated as ‘background conditions’ of voter suppression instead as causes on par with suppressive laws themselves,” report author and Senior Fellow Joshua Clark writes in the brief. “Taking this multi-causal view, we can see that the best investments for fighting voter suppression may be projects that build capacity and knowledge 'on the ground': comprehensive voter outreach, education, civic engagement, and community organizing and power-building,” Clark adds. Some clear-cut reasons why focusing solely on challenging restrictive voting laws in the courts fails to roll back their suppressive effects include the fact that courts often send laws back to legislators to be amended rather than abandoned, and that voters remain disenfranchised as legal and administrative processes play out. But perhaps more significantly, though less easily discernible, Clark uses recent research to show that the introduction of voter ID and other restrictive laws creates confusion among many would-be voters who mistakenly believe they do not hold an accepted ID; and that such laws also serve as a “last straw” in alienating potential voters who were already ambivalent about whether their vote mattered, or if elections make a difference in their lives. The report insists that state governments must make more robust efforts to educate citizens about the content of new restrictive voting laws, and that civic organizations should simultaneously prepare local leaders to serve as community advocates. It also calls on donors and advocates to recognize the key voting rights role played by organizations that conduct outreach to communities and groups that have limited resources and civic networks -- including the young, the poor, and those who are distrustful of institutions. Those committed to realizing equal and effective voting rights in the face of suppressive laws are best served by bolstering these organizations’ capacity. “When we strengthen efforts to activate and empower voters, we fight voter suppression by building knowledge, resilience, and advocacy,” Clark writes in the report. The report is Clark’s second major product in a multi-year initiative to study voting trends, civic engagement and disaffection, and structures of democratic inclusion. Last November, the Haas Institute co-released a report with the Tides organization analyzing the events and conditions that led to the unexpected outcome of the 2016 US presidential election. Future research will analyze the ongoing influence of racial, cultural, and economic anxiety across different segments of the US electorate, and how conventions in polling and voter targeting reinforce exclusionary biases. The Haas Institute for a Fair and Inclusive Society at UC Berkeley is an independent research institute bringing together scholars, community stakeholders, policymakers, and communicators to identify and challenge the barriers to an inclusive, just, and sustainable society in order to create transformative change. Visit haasinstitute.berkeley.edu to find out more.